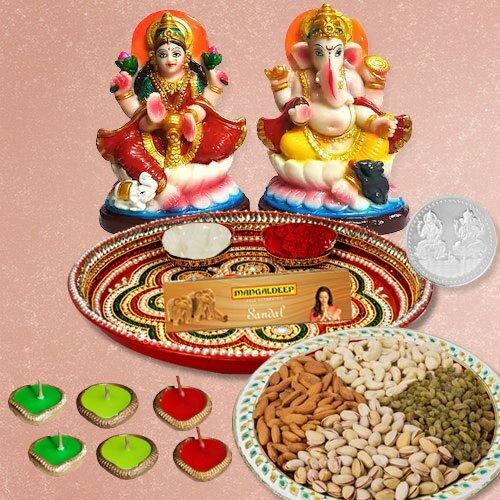 Send Diwali Gift of nicely wrapped Laxmi Puja Complete Hamper containing with Ganesh Laxmi Idol, Puja Samagri Kit, Puja Thali, Diya 6 pcs.with 100 Gms. Dry Fruits (Cashew and Raisins), and Free Silver Plated Laxmi Ganesh Coin. Send Diwali Gift of nicely wrapped Laxmi Puja Complete Hamper containing with Ganesh Laxmi Idol, Puja Samagri Kit, Puja Thali, Diya 6 pcs.with 250 Gms. Dry Fruits (Cashew and Raisins), and Free Silver Plated Laxmi Ganesh Coin. Send Diwali Gift of nicely wrapped Laxmi Puja Complete Hamper containing with Ganesh Laxmi Idol, Puja Samagri Kit, Puja Thali, Diya 6 pcs.with 500 Gms. Dry Fruits (Cashew, Raisins, Almonds and Apricots ), and Free Silver Plated Laxmi Ganesh Coin. Note: Thali Size 8 to 9 inch. Ganesh Laxmi Idol weight: 160 gms. Size:4-5". Gross weight applies for Dry Fruits.